Family holidays are the perfect way to slow the pace on busy lifestyles and reconnect with your partner and children. If you’re like any normal family, you probably spend your days worrying about packing lunches, getting the uniforms washed, the meeting you’re running late for, and whether or not lil Johnny remembered his swimming cap. Taking even a short holiday means you can forget about your day to day tasks and think about yourself and your loved ones and just spend time together having fun. But all holidays are not made equal. For a holiday designed to be family friendly there are a few essential items such as spacious rooms, a good pool, and facilities or activities for the kids. This holiday resort ticks all of these boxes. 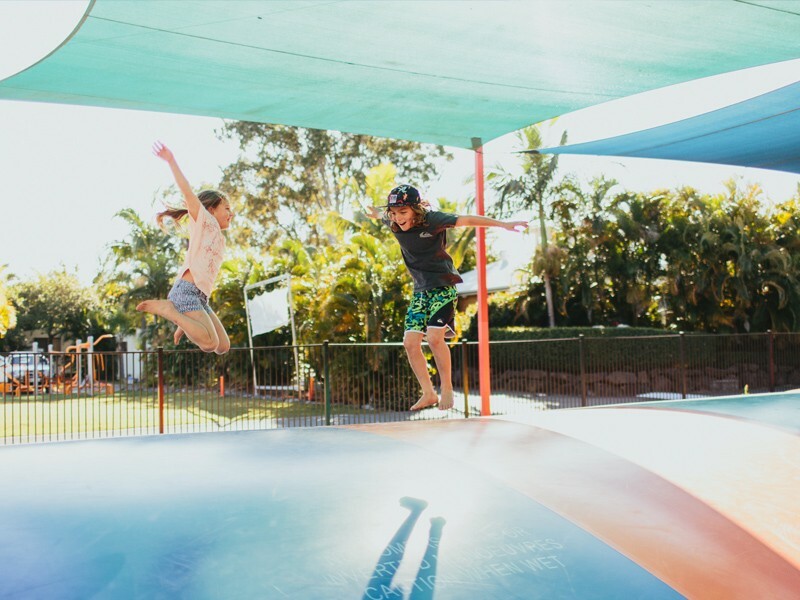 Here are our top reasons NRMA Treasure Island Holiday Resort is the perfect place to enjoy some family time. Everything from the room layout and bedding arrangements to the kids’ activities and facilities have been created and designed with families and children in mind. This means you can relax and enjoy your down time while the kids have a blast. There are Four Pools + a Waterpark. “I don’t want to play on the waterpark! !” said no child ever. There is a pirate ship, sea monster spraying water, misting whale body complete with watery tail. The interactive octopus as spurting tentacles, while the giant dumping bucket releases its tonne of water onto the adventurers below. There are also regular pools with day beds to enjoy a book or simply soak up the sunshine. Amazing Facilities. Jumping Pillow or Giant Chess anyone? The list of family friendly facilities at this park is impressive. There’s an entire pirate themed mini golf course, a giant jumping pillow, go kart hire, giant chess, children’s playground, Shipwreck Shores Waterpark, outdoor cinema, tennis court, half basketball court, TV and games room, DVD hire, and planned kids’ activities. Proximity to The Beach & Waterfront Parkland. If you jump on the Gold Coast highway and head south for 5 minutes (2 kilometres) you’ll hit a beachfront wonderland. There is an enclosed swimming area on the Broadwater that backs onto a huge waterfront playground. For a quick bite to eat, Charis Seafood is on the waterfront amidst the action and boasts some of the freshest most popular seafood on the Gold Coast. The largest Outlet Shops on the Gold Coast are next door. Harbour Town Outlet Shopping Centre is practically next door! Leave the kids with Dad and spend a few hours indulging in retail therapy hunting for incredible bargains with up to 70% off retail prices. If you need help convincing Dad, Harbour Town sports the Dublin Docks Tavern, that has a great playground for the kids and a healthy range of tap beers. Family time can be difficult to schedule in with competing timelines, work hours and priorities, but taking break to reconnect can make all the difference to your families happiness. Even if you can only escape over a weekend, the memories you create on holiday are worth it! Talk to our team at Discover Queensland about your next family holiday on 1300 788 553. 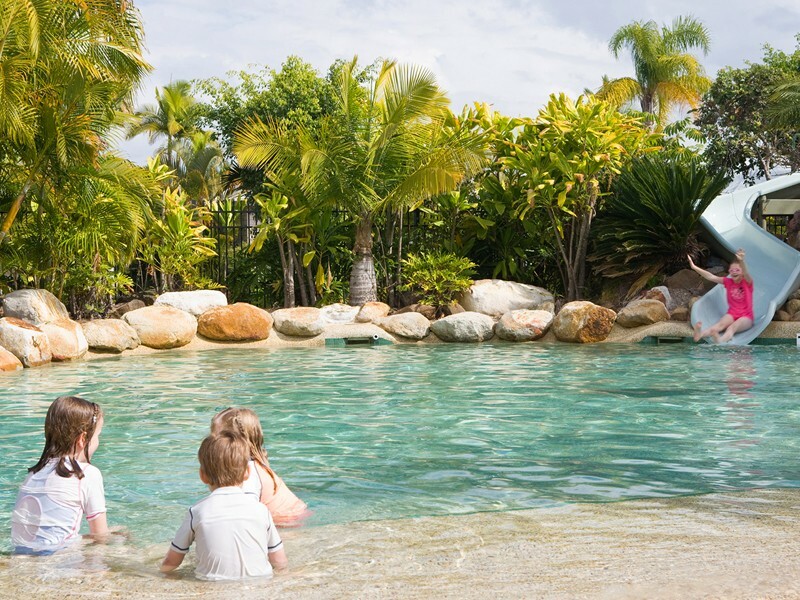 Enjoy the ultimate family holiday at the fabulous Gold Coast with a stay at NRMA Treasure Island Holiday Resort. This award winning holiday park is only a 15 minute drive north of Surfers Paradise and centrally located between all major theme parks.